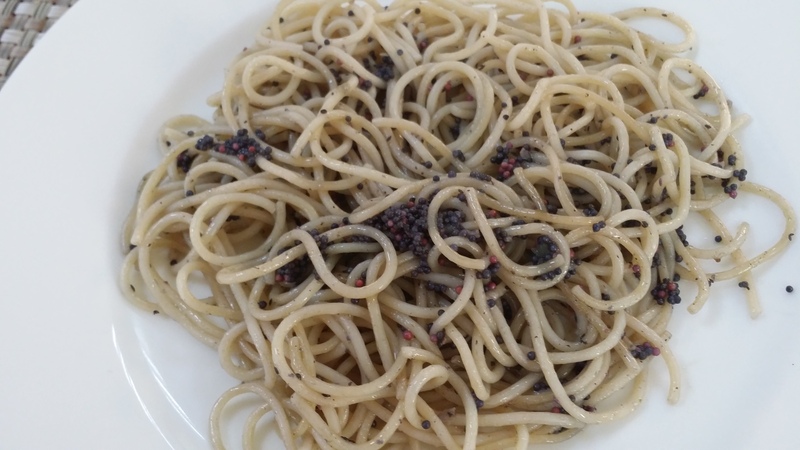 In my most recent ItaliAsian Fusion I have combined the already known Edamame Spaghetti with Organic Black Bean Spaghetti I have picked up at Choithram shop in Al Wasl Road and seasoned them with smoked salmon and seaweeds. Since this kind of pasta reminded me of Japanese like flavours, I decided to add some of the Nori seaweed sheets I had at home (the ones usually used for sushi) to the recipe. They taste like sea (of course) and are particularly rich in fibres and minerals. I heated some olive oil in a pan, I added some garlic and parsley and let them brown a bit. Meanwhile I chopped the salmon and cut the Nori sheets in long stripes almost resembling thick spaghetti or fettuccine. I added the salmon first and once it had changed colour, I added the seaweeds. The seaweeds are dry but highly hygroscopic, hence they absorb water from the other ingredients and become tender. 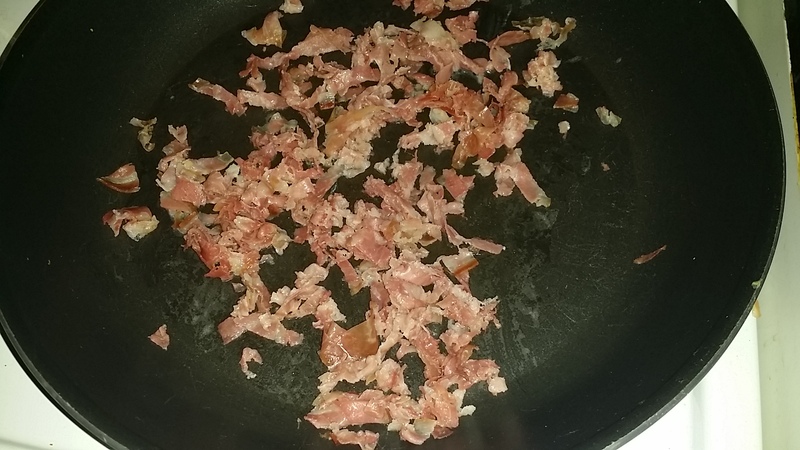 Once the spaghetti were cooked (4 to 6 minutes the time required), I dried them and added them to the pan. Mix all the ingredients together paying particular attention to the seaweeds that have the tendency to stick together instead of spreading around. Once mixed properly, I served the spaghetti with salmon and seaweeds together with a generous amount of grated Grana Padano. 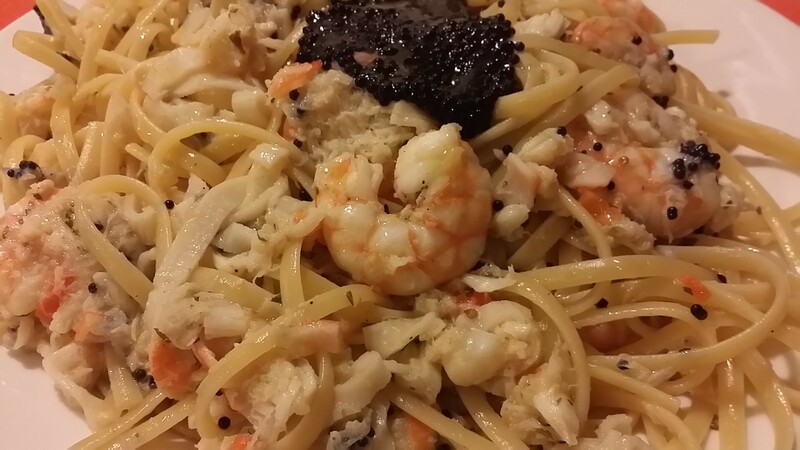 This entry was posted in Cooking, Easy to Cook, Food Explorer, Homecooking, Italian Food, Japanese food, Pasta, Spaghetti and tagged Black Bean Spaghetti, Edamame Spaghetti, Food Experiments, food lovers, Italian food, Japanese, nori, seaweed, Smoked Salmon on February 27, 2016 by andreadetto. I simply have a passion for pasta. And couldn’t be otherwise since I am Italian. I had pasta twice per day for almost 25 years of my life and only recently I started reducing my daily intake, since I have a sedentary work and a carbohydrates rich diet is not really recommended. In a first attempt to reduce the carbs intake, I started enjoying the ‘integrale’ version (whole wheat pasta) because richer in fibers and proteins than the normal one and with a good 10-15% less carbs per portion. 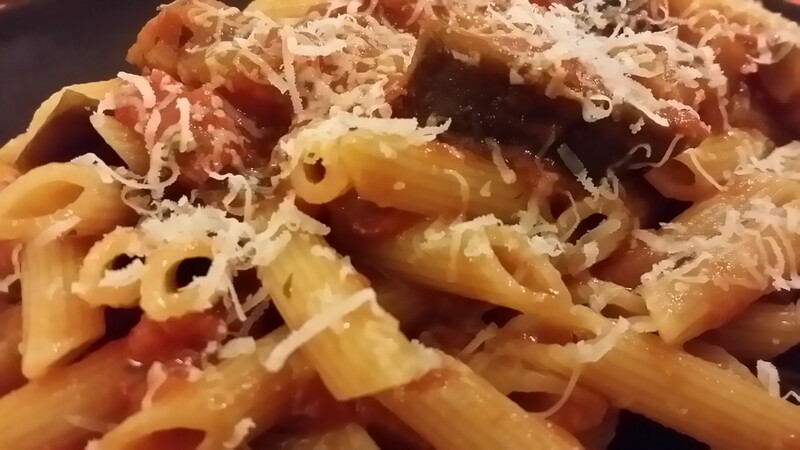 Taste and consistency is different from the traditional pasta but it is fairly good. Some days ago I was screening the supermarket shelf looking for whole wheat pasta or a different version like kamut or barely pasta just for a change when my attention was caught by strange product available: Organic Edamame Spaghetti. 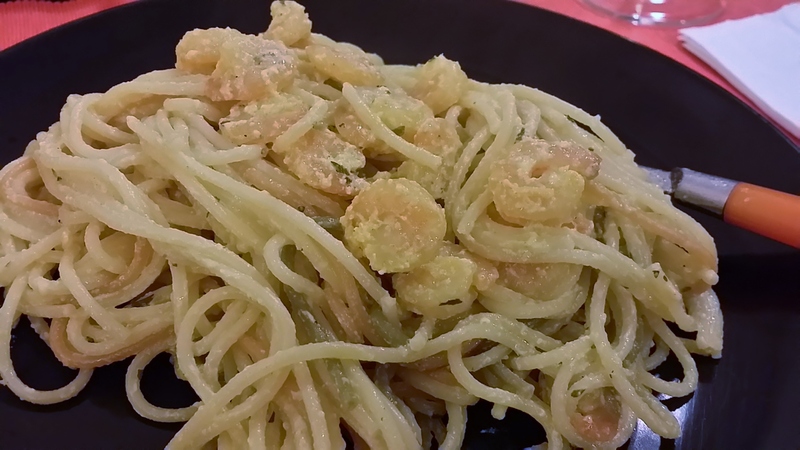 A combination of the famous Japanese snack in the most famous Italian shape pasta. The Organic Edamame Spaghetti bag says they cook al dente. A mandatory prerequisite for an Italian. 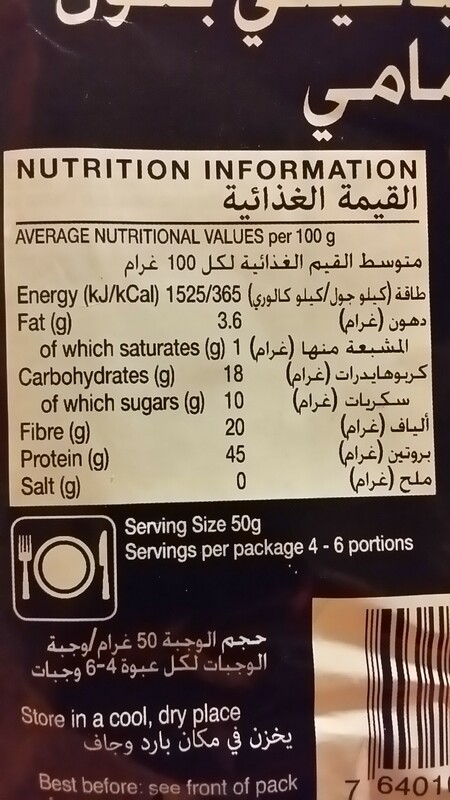 The particularity of this kind of spaghetti is that they are made with edamame flour instead of the common wheat one. It sounded weird at first but I decided to give it a try because of the exceptional nutrition facts: only 18g of carbs in 100g of spaghetti and an astonishing 20g of fibers and 45g of proteins!! Like having a steak but in a vegan-spaghetti-like form. 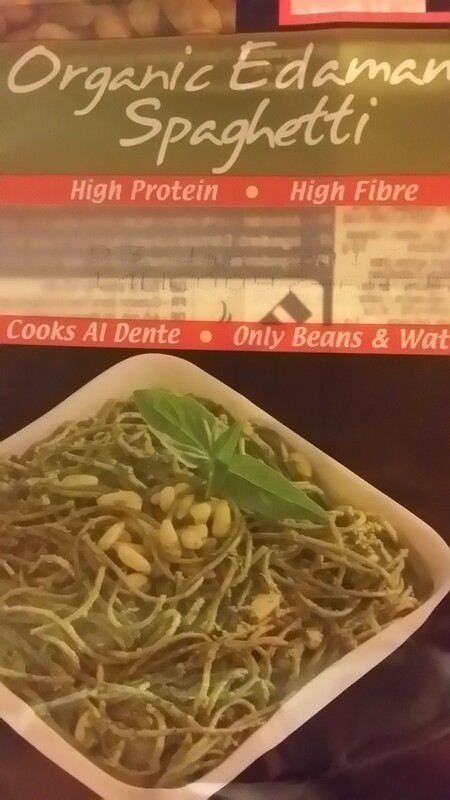 The Edamame Spaghetti are superb for an high protein, high fibers and low carbs/fat diet. 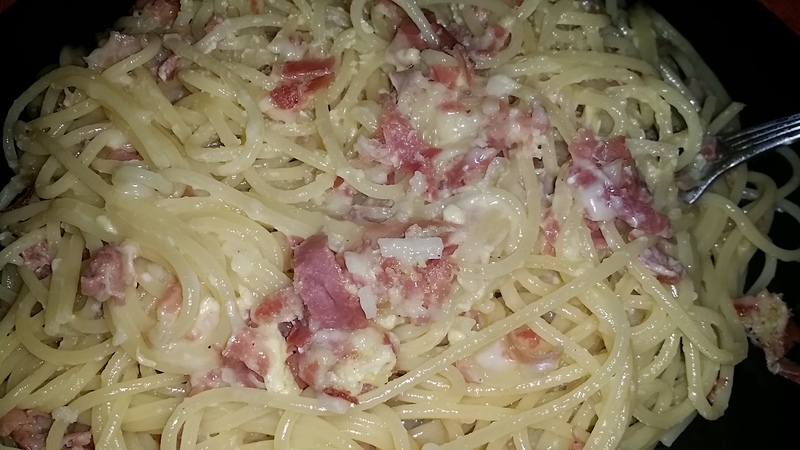 I was curious to try the newly bought spaghetti that clearly mentioned “cook al dente” and prepared an easy dish with surimi and butter sauce. By the time the edamame spaghetti were cooking (around 9 minutes), I sliced the surimi, put it in a pan and added some butter, olive oil and nutmeg. The meal was surprisingly good. The edamame spaghetti cooked ‘al dente’ maintaining a good texture. They taste differently from any other kind of pasta I have ever tried before. I would say it reminded me to sea flavors and aromas and I got lucky to combine it to some fish products as first experiment. We really enjoyed the spaghetti meal, appreciating the rich taste of the edamame based pasta and its protein content like meat, fiber content as a super veggie and low carbs and fat content. Definitely a nice surprise that we are going to explore deeper since there are many variants available. A simple but tasty meal prepared with edamame spaghetti and surimi. A creative and healthy Italian-Japanese fusion really appreciated. 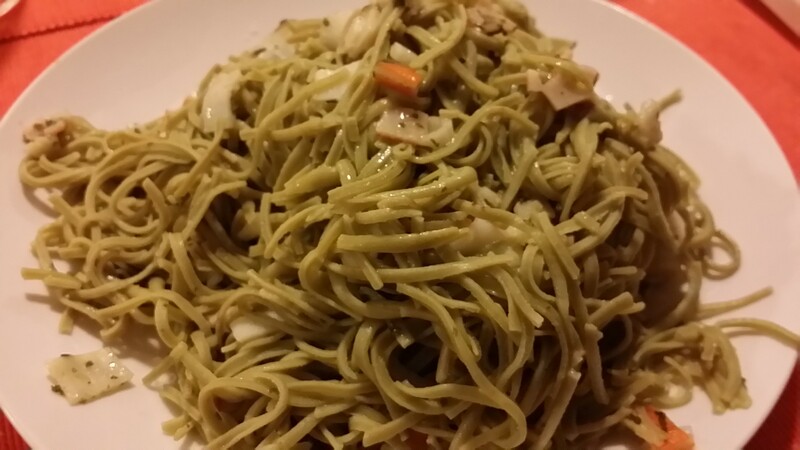 This entry was posted in Easy to Cook, Food Explorer, Homecooking, Pasta and tagged Asian Food, edamame, Edamame Spaghetti, Fusion, Healthy Food, Healthy Meal, Italian food, Pasta Lovers, Spaghetti, surimi on November 4, 2015 by andreadetto.